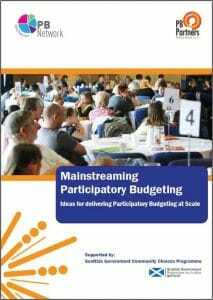 This briefing has been produced in response to Scotland’s Community Choices programme and aims to support public sector organisations wishing to develop ‘mainstream’ Participatory Budgeting(PB) initiatives. It is relevant to any organisation working in the UK with an interest in furthering democratic engagement at scale. It builds on learning about PB since 2000, when the first UK learning exchange to Porto Alegre took place. In 2008 the Department of Communities and Local Government promoted a national PB strategy in England. Examples in this paper include examples from that time, as well as more recent experiences in Scotland and elsewhere. Within Scotland the Scottish Government has been raising awareness of PB since 2014 and setting the conditions for it to be delivered in a meaningful and sustainable way. For example, the Community Choices Fund is a new mechanism to support PB in Scotland. It was first made available in 2016/17 to enable local people to make decisions on local spending priorities and contribute towards stronger local democracy. Key to its objectives is to move towards larger scale PB, and that means mainstreaming. PB complements the objectives of the Community Empowerment (Scotland) Act 2015, which provides a legal framework to promote and encourage community empowerment and participation. Creating new rights for community engagement and placing new duties on public authorities. It will take time to reach PB at scale, but in order to do so you must begin somewhere. “I want us to be ambitious in what we do which is why we are committed to ensuring local authorities have a target of giving at least 1% of their budget to Community Choices. This amounts to tens of millions of pounds which will be in the hands of local people to decide how best to spend that money in their communities, on their priorities.” Kevin Stewart MSP, Minister for Local Government and Housing, 2016.